This case is designed to protect the iPad 2 and comes with an integrated easel which optimizes hands free viewing with multiple angles. This case comes with the removable molded plush foam liner in the bottom and lid of the case to fit and secure your device. 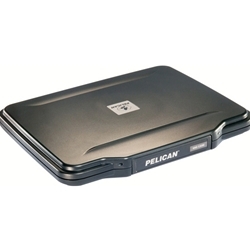 Pelican HardBack case is great for protecting tablets with the molded plush foam liner insert that protects against impact shock and scratches. Slip the HardBack case into any soft bag and know it is secure by the easy-snap latch that locks out moisture. This case is designed to protect most 10 inch tablets including iPad, iPad 2 and the iPad 2 with smart cover. Be sure to measure your device and make sure it will fit inside the case before purchasing. Interior Dimensions9.96" x 7.76" x 0.81"
Exterior Dimensions10.86" x 9.28" x 1.24"
Shipping Dimensions12.00" x 11.00" x 3.00"